As you can see, my love for food is now extending beyond cooking! 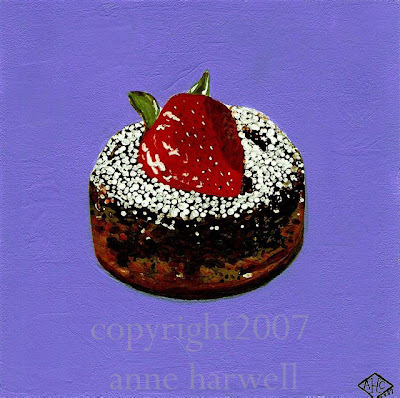 This is an original painting of a chocolate souffle cake topped with powdered sugar and a strawberry. The background is very textured and a deep periwinkle blue. Painted on 1/4 inch gesso board w/painted edges. Perfect for framing or leave as is. Just wanted to thank Victoria of SF Girl By Bay for including my "Royal Silhouette" collage in a photo grid today as part of today's post. 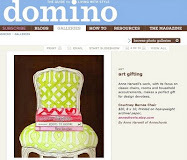 Victoria is a great style/art/decor scout who always manages to spot something beautiful or unique and pass it on. Her writing style is warm, personal, witty and insightful. If you aren't already one of her readers, check her blog out now. I know you will soon be adding her to your favorites list. The votes are in! 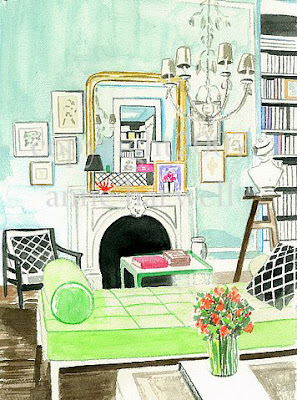 Congratulations to the winners in the "10 Most Influential Design Bloggers" Poll. 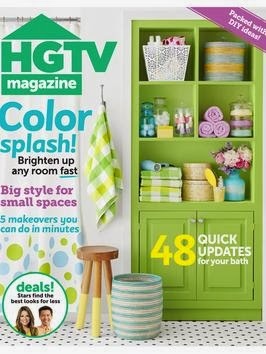 I'd like to send special congratulations to my friend, Holly Becker of Decor8, for making the list! Check here for the results and more info! This is an entirely hand made collage, not a print. 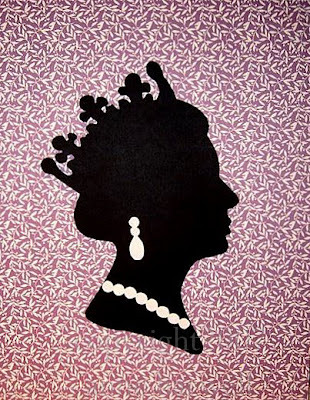 Collage features white hand-cut jewelry on black silhouette of Queen Elizabeth 2 of England's profile with a purple and white leaf-print background. I had fun creating this partly because of it's very strong graphic quality. I also love the silhouette for it's classic beauty - feels like decorating a stamp or coin and colorizing it a little. Sort of what I'd call neo-traditional pop art. Work is mounted on an 11x14 gesso board, ready for framing or even perfect on its own! Protective coating included. Signed and dated by artist on the back. 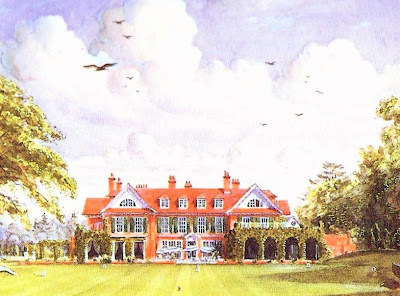 Watercolor study of English Country residence, Chewton Glen . 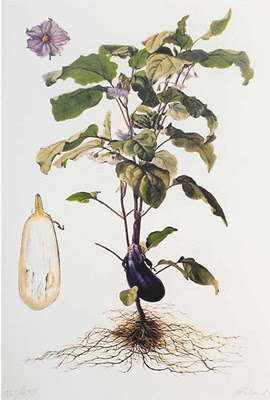 Eggplant (or as the British call it, Aubergine) This is available as one in a series of 4 vegetable lithographs available for purchase on Graham's website. There is a botanical series as well. 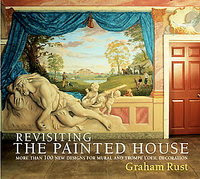 Graham Rust is an amazing artist who hails from Great Britain. From the first moment I saw his work over a decade ago, I have been inspired. A close friend gave me one of his books, and it, along with another I acquired, are two of the most valuable volumes in my library. His flawless composition, deft execution, and eye for detail are unparalleled. He has distinguished himself as a master of trompe l'oeil, large scale murals, and seemingly everything he chooses to capture with his brush. He was born Graham Redgrave-Rust in Hertfordshire, England in 1942. He later was schooled at the Polytechnic School of Art, Regent Street, as well as the Central School of Arts and Crafts in London and the National Academy of Art in New York. Afterward, he worked as an artist on "Architectural Forum" for Time Inc. His first exhibition was at the Royal Academy in 1965. Hardly a shabby beginning! 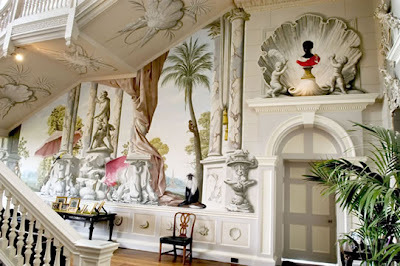 He has painted in Europe, North and South America, India, Greece, North Africa and the Far East. 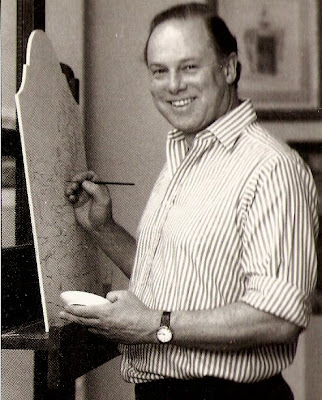 He also spent a year at the Woodberry Forest School, Virginia, USA, as artist-in-residence in the late 60's. 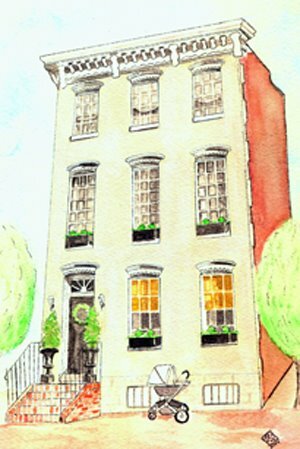 He is know the world over for his residential commissions in homes of distinction in all corners of the globe. 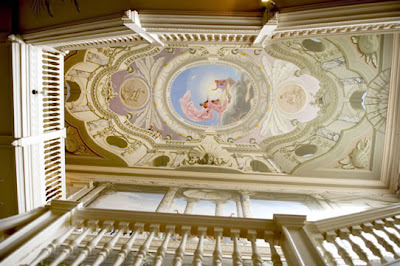 Perhaps he is best known for the phenomenal "Temptation", a mural of gigantic proportions that he worked on for 10(!) 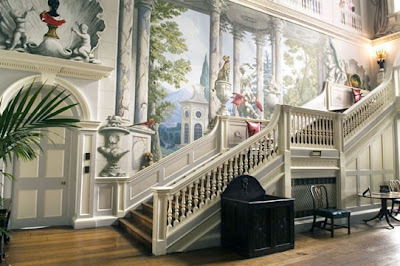 years at Ragley Hall in Warwickshire, England. His first book was published in 1988. This book, "The Painted House" comprised his mural designs and continues to be a favorite that has been published in 4 languages. It's a timeless and beautiful book, which was followed 10 years later by "Decorative Designs", and "Needlepoint Designs", both in 1998, and "The Painted Ceiling", in 2001. 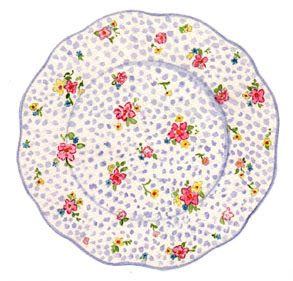 Graham is also an illustrator for several books other than his own, including the 1986 version of "The Secret Garden"by Frances Hodgson Burnett. Ok, admittedly, I have been a little short on time this week because of my work load, so I am pulling up a piece from my archives, making myself very vulnerable here. This is one of my very early (and I stress EARLY!) 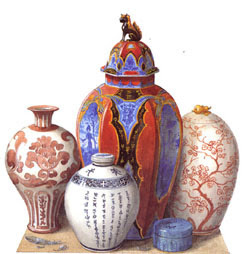 watercolors, done in 1995, when I had just started painting. I was inspired by a watercolor sketch done by Winterhalter, a famous English painter who was commissioned to do many royal portraits. 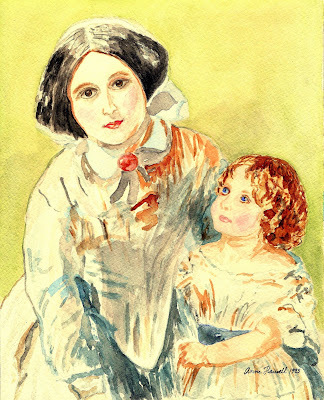 This is of one of Queen Victoria's daughters and her nursemaid, painted in 1850. I am amazed by the fact that these works have been preserved so well. 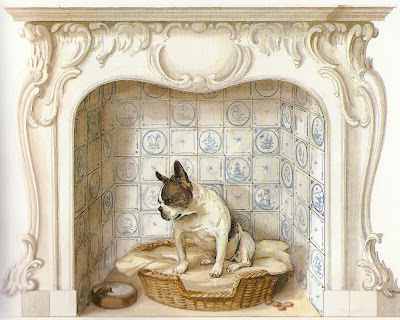 Stay tuned for more posts on historic watercolors in the future. Hope you all have a great weekend! 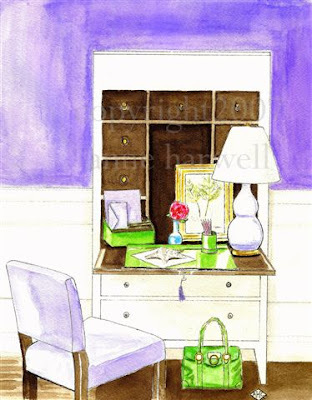 Just wanted to thank a new friend, Su Ling, in Singapore, for the nice mention today on her blog Laissez Faire Design. Su Ling is a design aficionado and WAHM (work at home mom) who somehow also manages to keep up with writing 3 different blogs on a regular basis! Very impressive! 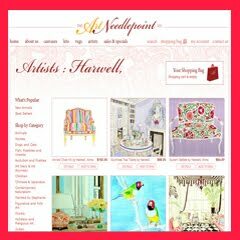 Stop by and check out her design blog when you get the chance! 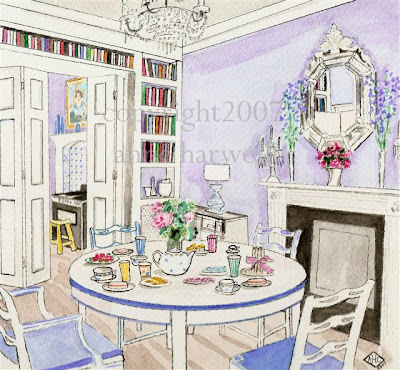 This painting is of a beautiful conservatory room in a Georgian estate in the deep South created by interior designer Richard Keith Langham. 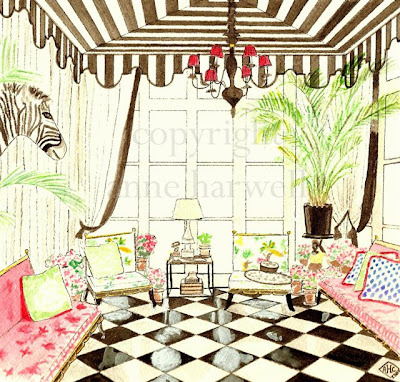 It features a black and white tented ceiling, black and white tile floor and gold-trimmed black tole furniture with punchy upholstery. 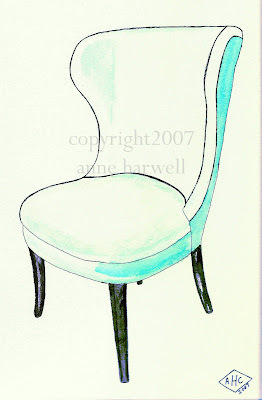 The third oval-backed Louis chair in a series of 3. 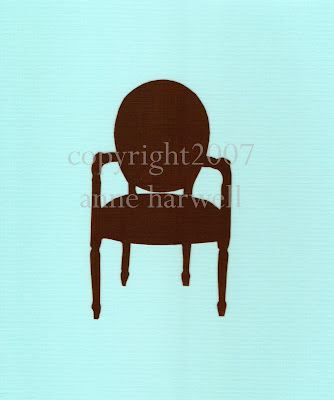 This one a chocolate brown chair on a robins egg blue background. Ready for framing or perfect as is, with protective finish and painted edges. Signed and dated by artist on back. Watermark not present on actual piece.